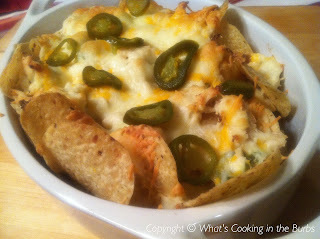 These nachos make a perfect Friday night snack and can be served as an appetizer or a meal. They are a fun twist on your regular nachos and oh so delicious! In a medium bowl mix together the cream cheese, 1/2 cup of the cheddar cheese, and jalapenos.. Add in the chicken and combine. Arrange the tortilla chips in a baking sheet top with the chicken mixture and remaining 1/2 cup of shredded cheddar. Top with additional pickled jalapenos. Enjoy! Bake at 375 for 20-25 minutes. Top with additional sliced jalapenos. Enjoy! Sounds yummy AND easy. My kind of meal! I love these. I used to get these at Shorty Small's. I haven't made them in a long time. You have reminded me that I haven't been eating enough comfort food lately. These are really good.